(Nanowerk News) The dramatic rise of smartphones, tablets, laptops and other personal and portable electronics has brought battery technology to the forefront of electronics research. Even as devices have improved by leaps and bounds, the slow pace of battery development has held back technological progress. 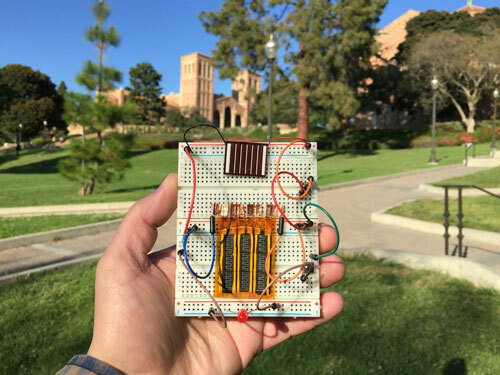 Now, researchers at UCLA’s California NanoSystems Institute have successfully combined two nanomaterials to create a new energy storage medium that combines the best qualities of batteries and supercapacitors. Supercapacitors are electrochemical components that can charge in seconds rather than hours and can be used for 1 million recharge cycles. Unlike batteries, however, they do not store enough power to run our computers and smartphones. The new hybrid supercapacitor stores large amounts of energy, recharges quickly and can last for more than 10,000 recharge cycles. The CNSI scientists also created a microsupercapacitor that is small enough to fit in wearable or implantable devices. Just one-fifth the thickness of a sheet of paper, it is capable of holding more than twice as much charge as a typical thin-film lithium battery. The study, led by Richard Kaner, distinguished professor of chemistry and biochemistry and materials science and engineering, and Maher El-Kady, a postdoctoral scholar, was published in the Proceedings of the National Academy of Sciences ("Engineering three-dimensional hybrid supercapacitors and microsupercapacitors for high-performance integrated energy storage"). “The microsupercapacitor is a new evolving configuration, a very small rechargeable power source with a much higher capacity than previous lithium thin-film microbatteries,” El-Kady said. The new components combine laser-scribed graphene, or LSG — a material that can hold an electrical charge, is very conductive, and charges and recharges very quickly — with manganese dioxide, which is currently used in alkaline batteries because it holds a lot of charge and is cheap and plentiful. They can be fabricated without the need for extreme temperatures or the expensive “dry rooms” required to produce today’s supercapacitors. The researchers found that the supercapacitor could quickly store electrical charge generated by a solar cell during the day, hold the charge until evening and then power an LED overnight, showing promise for off-grid street lighting.